Ongoing monitoring of tags is a crucial final step to any solid Tag Governance process. After all, you need to be aware of any data collection and tracking issues as soon as they arise in order to ensure complete and accurate reporting within analytics and media platforms. 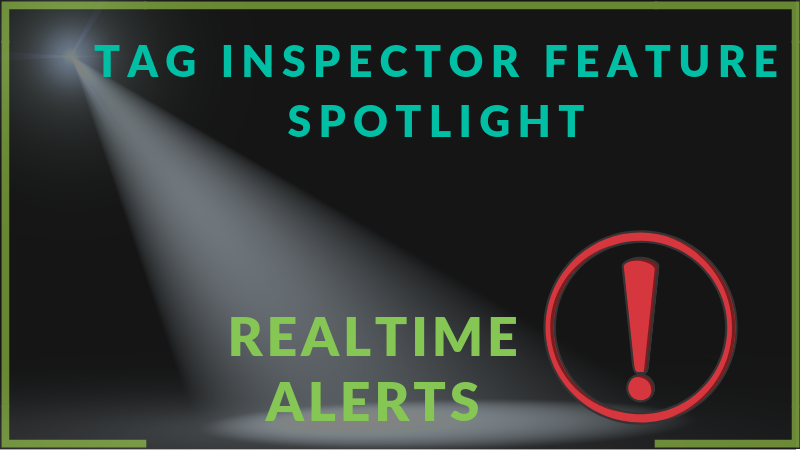 To be notified of any of these issue in real-time, Tag Inspector Alerts can be configured for any Validation Rule created within your Realtime account. These allow you to be notified within 30 minutes of any tag dropping off the site or specific data point no longer being collected according to your specifications. Below, we explore the functionality and configuration options of the Realtime Validation Alerts. Validation Alerts are attached to any and all Validation Rules created within Tag Inspector Realtime. Simply create the Validation Rule and then add an alert so you and your team can be notified in real-time of any tagging issues arising on your site. Alert Name - Give a name to the Alert to easily identify. Description - Insert a description of the Validation Rule being tested. This will be viewable in the alert notification to easily understand what has broken. Rule to Test - Select the Validation Rule that should be evaluated for the Alert. This is the rule that will trigger the alert when the failure rate passes the defined threshold. Alert If - Select the threshold of failure at which you would like to be alerted. The most common option here is to be alerted when the Failure Rate of the selected rule is more than 10%. Also define the time frame of validations that should be evaluated. In the example above 1 hour is selected. What this means is that the system will look at all validations for the selected rule over the past hour. If the failure rate of those validations is above 10% then the Alert will be activated. Emails - Input the emails of who should be alerted. Check This Condition Every - Here you select how frequently you would like the system to check the Alert Status. This is the time interval at which the system will check the status of the Alert. If an Alert is in an “alert state” when the status is checked, emails will be sent to those selected in the previous option. 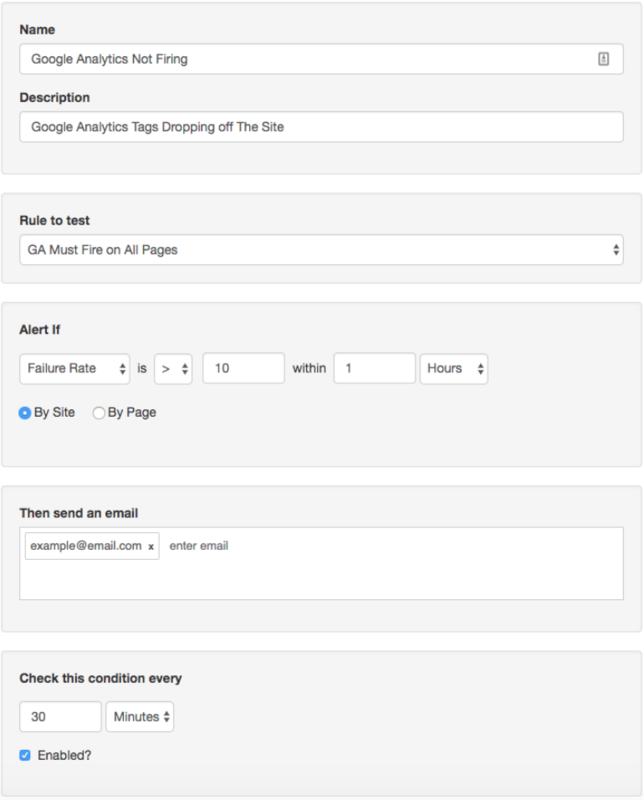 Example: Using the logic in the Alert configuration pictured above as a reference: The Validation Rule “GA Must Fire on All Pages” will run on all page loads of a website looking for a Google Analytics tag to fire. Whenever a GA tag does not fire, the rule will fail. Our Alert, “Google Analytics Not Firing”, will look at the Failure Rate of the rule for all validations that have run over the previous hour. If the Failure Rate of those validations is above 10%, this will go into an “Alert State”. Every 30 minutes the system will check the status of the Alert. If the status is in an “Alert State” when this check occurs, an alert will be sent to the email addresses listed within the Alert configuration. In this example, if Google Analytics stops firing on the website in question, the operations team will receive an email notifying them of the tagging issue within 30 minutes of the failure occurring, allowing them to remediate the issue with only minor data loss. Above is an example of the email that will be generated for an Alert. As you can see, the Alert Name, Description, and Status are all listed along with specifics for the configuration. The team can click the link to “view” and access the failure information within the Tag Inspector UI to gather the context to remediate the issue observed. 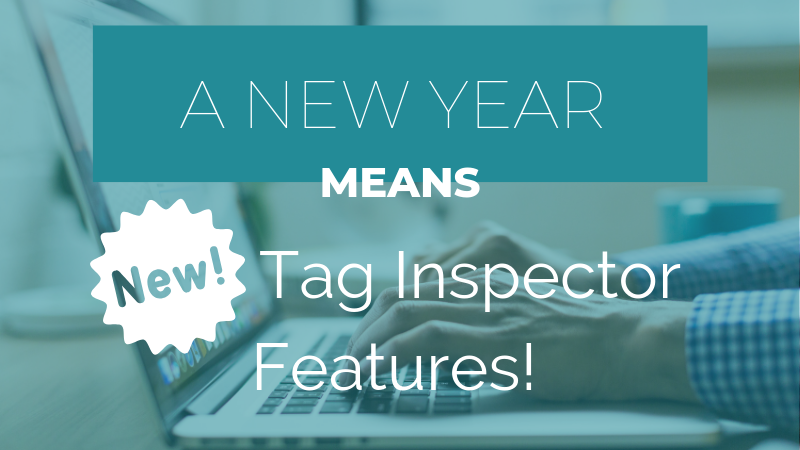 Stay on top of your tagging and data collection architecture with the Tag Inspector Alert functionality. After the initial set-up of Validations according to the tagging requirements on your website, Alerts will allow for comprehensive automated monitoring of all tag behavior and data collection. Tag Inspector is utilized on over 6,000 websites globally to monitor tag behavior. Contact us to discuss all of your tag auditing and monitoring needs. We’d love to help! Are the 2016 Presidential Candidates Secretly Collecting Data about You?